“That’s one small step for man, one giant leap for mankind.” Celebrating the fiftieth anniversary of the Apollo 11 moon landing on July 20, 1969, this installation in the History of Photography Gallery examines the intersecting histories of photography and space exploration. 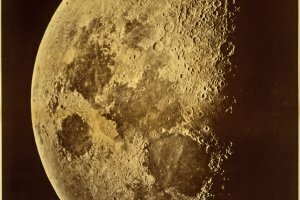 A source of artistic inspiration, scientific inquiry, and popular fascination, the moon has long been an important subject of visual culture since before the invention of photography. This selection of objects from the photography collection ranges from stereoscopic views made through a telescope, amateur snapshots, and scientific documents to artworks by Louis-Jacques-Mandé Daguerre, Ansel Adams, László Moholy-Nagy, and Linda Connor, among others. Admission: $15 adults, $13 seniors, $5 ages 5-17 and students (w/ID). Free for children 4 and under.